Prepare personalized fortunes by handwriting notes or printing them from the computer. Cut them into small strips (about 2 inches long by 1/2 inch high). Unroll pie crust on a cutting board and use a glass or cookie cutter to cut out 16 circles (about 2-1/4 inches to 2-1/2 inches in diameter). Space very closely to get all on one crust. Reroll scraps if necessary. Take a pie crust circle and place a folded fortune strip in the center. Fold circle in half with fortune inside, and pinch edges (not center) to seal. Place on an ungreased cookie sheet. Repeat for remaining circles. Bake cookies at 450° F for 8 to 10 minutes until golden brown. Do not underbake. Remove from cookie sheet to cooling rack and allow to cool completely. Melt 1/4 cup chocolate in the microwave for 30 seconds. Remove and stir. Return to microwave for another 20-30 seconds and stir until chocolate is smooth. Drizzle chocolate over cookies, or dip edge of cookie into chocolate. Decorate with sprinkles if desired. Allow chocolate to harden completely before serving. Package in Chinese food take-out boxes found at craft stores. 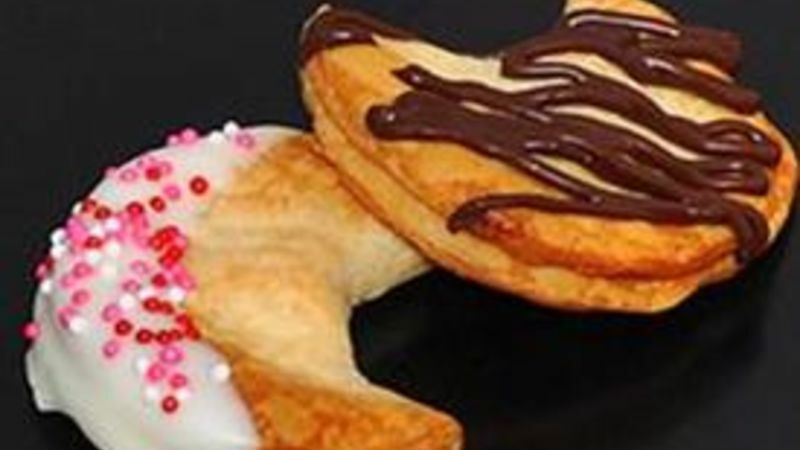 Give your sweet stuff a personalized love note -- in a fortune cookie! It's the perf DIY Valentine's gift! How many cool ideas are there for Valentine's Day? Lemme count the ways. BUT...here's the coolest yet. Guaranteed to send your heart into v-fib. These personalized make-em-yourself Fortune Cookies are super quick, super easy and totally custom! First, use your computer or hand-write some "fortunes." Cut them into little strips about 2" long by 1/2" high so they look all fortune-cookie-y. Next decide if you're gonna use a refrigerated crust or roll out your own all afternoon. Then open the fridge and pull out a ready-done Pillsbury pie crust. You is so smart. Now, find something round that's about 2-1/4" to 2-1/2" in diameter. Cookie cutter, biscuit cutter, glass...whatevs yous gots. Pinch the edges (not the center) of the half-circle to seal it, then bend it toward the fold. Try to make the "belly" puff out a bit so your fortune cookie has dimension and isn't flat like a pancake. The Chinese fortune cookie factories will then be proud of you. Line 'em up on a cookie sheet. And bake them at 450 degrees for about 10 minutes -- 'til they're golden brown. So cute already! But ... they're naked. Now they're ready to strut their stuff! Personalize them for your lovies. This one's for my daughter the soccer dudette. I shoulda put her jersey # on there! And what better way to package them for gifts than in a Valentine Chinese take-out box -- natch! Your turn -- go make these!